Channa Pulao is simple healthy dish.It's a easy lunch box recipe too. You can either use Black channa or white one. Soak channa over night. Clean and soak basmati rice for 15 minutes. Heat oil in a pressure cooker, add item under To temper , once splutter add onion and saute till translucent. Add ginger garlic paste and cook till raw smells goes. 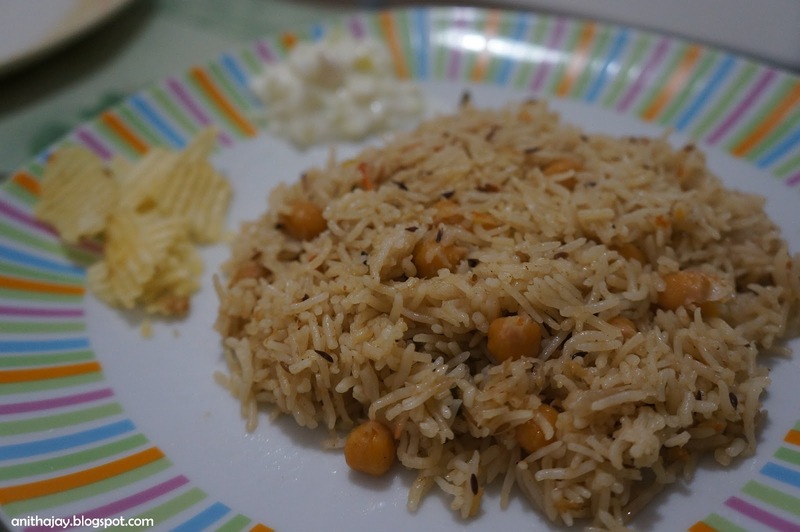 Add tomato , channa and some salt and saute for 5 minutes . Add Garam Masala mix well. Add 1 1/2 cups of water,salt and allow it to boil. Once boiled add rice and close the cooker. Cook for 3 hisses. Wait till the pressure goes and serve hot with raita.